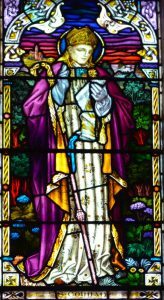 St. Colman of Cloyne is the Patron Saint of the College. Born around 530A.D, we know that his missionary work was principally in East Cork and that he founded a monastery for male religious at Cloyne. The round tower as seen nowadays is built on the site of that monastery. Perhaps you will have noticed the College crest already:- it displays the symbol of the cross on one side of the round tower and the scholar’s quill for writing on the other. Together they remind us of the pursuit of holiness and of the student’s call to the learning that are set as a challenge to all who follow Christ. The College motto is “Dilis do Dhia agus d’Eirinn”, meaning “Faithful to God and to Ireland”. St. Colman’s is a voluntary Catholic all boys’ secondary school, nowadays a day school only within the free education scheme and open to all students. 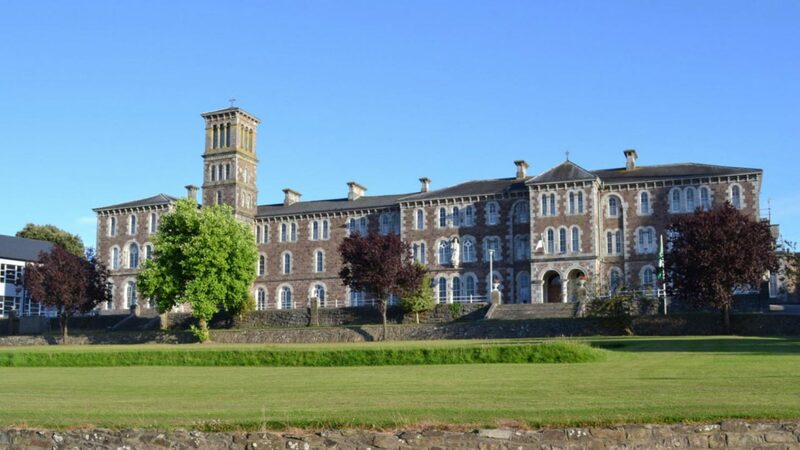 It is described as a Diocesan College simply because it was originally built on the instructions of the Catholic Bishop of the Diocese of Cloyne and other trustees in 1858 to provide a high quality Catholic education for the young men of the diocese. These were the explicit instructions/intentions attached to the founding Deed of Trust. Such instructions are foundational to what is nowadays called the characteristic spirit or Catholic ethos of the College. Every school in fact throughout the world has an ethos of some kind-- there is no such thing as a school free of ethos. While there are many secondary schools in Ireland with a Catholic ethos (under various Trusts such as ERST and CEIST), St. Colman’s belongs to a particular group of forty diocesan schools directly under the trusteeship/patronage of the Irish bishops concerned. Cloyne has four such diocesan secondary schools within that network. Although it is a Catholic school, St. Colman’s College is equally welcoming to and is respectful of students of other faiths and of none, as is clear from its admissions policy. St. Colman’s strives to achieve the highest academic excellence for all and to be open for dialogue with all. The College’s Mission Statement (framed at the front door entrance) is a clear expression of how the Management, the Staff and Student body seek to fulfil the founding intention of the Trust. Over the past 160 years, people from the many parishes within the diocese of Cloyne and surrounds have appreciated and highly valued the education that they and their families have received in this faith environment. Most notably, one recalls the hundreds of students who went on to be diocesan priests in the diocese of Cloyne and missionary priests in many countries. Likewise, there are past pupils who are laymen of great Christian commitment and distinction working in many careers locally and across the globe. This inherited faith tradition needs to be supported and nourished in new ways and in new generations. The idea of ethos needs to be combined with mission and witness. Ethos is not a vague philosophy or attitude to life, but something that is witnessed to in the daily life and commitment of all who share in the educational enterprise -- trustees, board of management, principal, staff, parents and students. Just to declare an ethos (within a picture-frame) at the front door means very little. Ethos will only become a reality when the entire educational community in a school takes responsibility for that ethos, shares it and lives it. Catholic Schools continue the work of Jesus the teacher. Jesus is called “teacher” on forty-six occasions in the Gospels. It is the title most commonly associated with him in the Gospels. His was a healing ministry, a setting free, an invitation to become Christ-like, a leading out into somewhere new, namely the kingdom of God where all of one’s talents can be used for personal growth and for the common good. St. Colman’s College is committed to continuing this ministry of Jesus. St. Colman’s, like other Catholic schools, colleges and universities is part of a living tradition. The mystery of Christ from the time of the first Christian gatherings is something that we receive rather than create. It was proclaimed in God’s word and found life in the daily faith and caring response of succeeding generations when for example, parents were inspired to live it and to pass it on. The reality of a faith tradition is the bedrock for Catholic schools. Schools that are embedded in Catholic tradition and seek to live it for our times are a key part of the life of the Church. St. Colman’s pupils participate in many charitable projects and activities of Christian and Catholic import through the school year. Catholic schools respect both faith and reason. There is no contradiction between being a fully educated person and a committed Christian. Rather the contrary is true. Both faith and reason working together for the good of civilization can open doors to a new range of possibilities that are emerging through information technology. St. Colman’s, like other Catholic Schools, is called to support Catholic parents who wish to have their teenage children nourished and strengthened in faith, not just in a private way but also so that their faith may be lived and practised in the public arena. Religious education, as with other subjects, is part of the educational class day in St. Colman’s. But personal formation in the faith, sometimes called catechesis, or devotional practice, is also an integral part of a full Religious education programme. A living partnership between home, school and parish raises the consciousness of all. St. Colman’s College has a residential Chaplain, appointed by the Diocese, among its pastoral care and teaching staff. He is Fr. Eamonn Barry, a priest much experienced in Youth retreats and Parish Missions. He celebrates special Masses on important occasions for class and school groups. He offers spiritual guidance, counselling and prayer opportunities for many. In a faith school, such as St. Colman’s, league tables are not everything. Parents and pupils may, of course, during school hours visit the College Chapel which was built in 1912 thanks mainly to the generosity of the late Canon Patrick A. Sheehan, past pupil, prolific writer and novelist (Glenanaar, The Graves of Kilmorna etc. ).